I was able to finish this quilt up in about 3 weeks. This is the quickest I have ever finished a quilt, and my biggest quilt to date. I did custom feather quilting in the colored fabrics and a meander in the white areas. The quilt isn’t really that see through, it was just really bright outside. 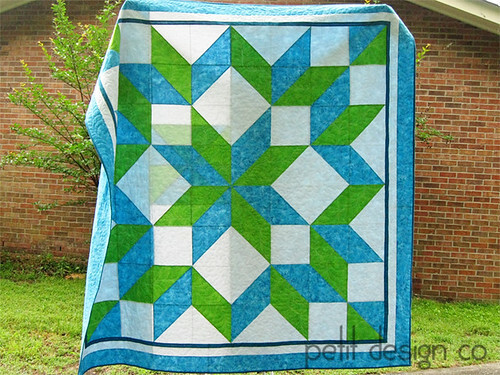 You can see the quilting a little bit better in the white areas of this picture. I love it--the giant pattern, the colors, and the back piecing! Good job, Norma. me encanta! el diseño y los colores son fantásticos!! usaste algún patrón? It is beautiful! I particularly love the pieced back. This is so pretty! Love the colors and big pieces. 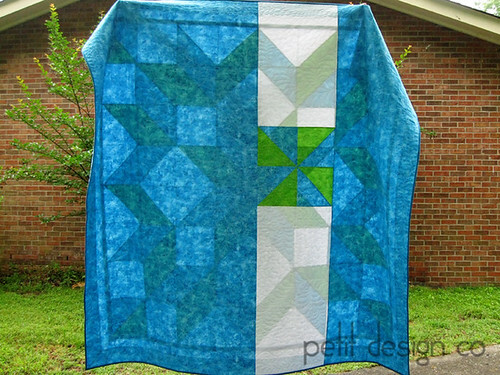 I love these colors so much... what a beautiful quilt! I gave you a thank you on my blog today for your 31 Days of Walking Foot Quilting series. It helped me fall in love with my walking foot and get a lot of UFOs done too! Love the colors and size of the pattern! Great back too with the strip and pinwheel! Beautiful!